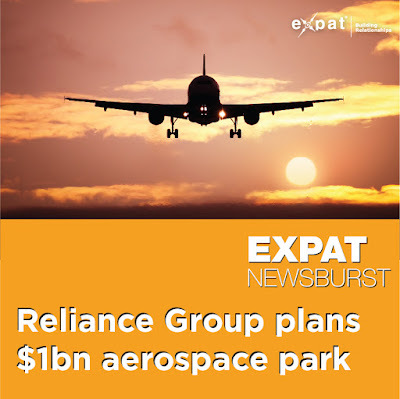 The Expat Compass: Expat NewsBurst: Reliance Group plans $1bn Aerospace Park. Expat NewsBurst: Reliance Group plans $1bn Aerospace Park. The Anil Ambani-owned Reliance Group has selected Mihan near Nagpur in Maharashtra for developing India's first smart city for the defence sector. Known as Dhirubhai Ambani Aerospace Park (DAAP), the smart city will be developed at a cost of $1 billion to manufacture helicopters for both commercial and military applications. The project would be the first integrated facility in aerospace structure, engine design and manufacture, fabrication and platform integration in the country. The move is part of the Reliance Group's aggressive play in defence, seeking to capture a slice of the $100 billion worth of opportunities that the sector would soon throw up as part of the NDA government's 'Make in India' programme to focus on indigenous manufacturing of defence equipment.